No. The 500 was $900 and they wanted like $2600 for a 1k. I told them I’d add another 500 later. I think my Kubota would pick it up empty but I'm struggling to justify a bigger tractor until I get either parcel on the north or east of me...or both. Not to mention, did I mention I just paid for a pool? SMH.... I hope I don't have to move it. Its pretty strategically located. 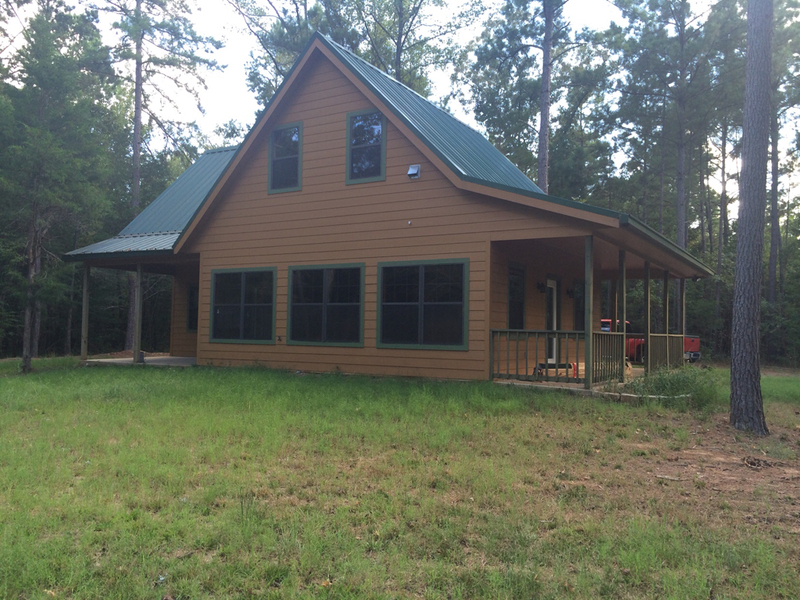 central to the house, shop, casita and outdoor kitchen. Wow, a pool....So who gets to keep it clean. Every needle, twig, creepy crawler in the county will be in it if it is an outdoor model. I like the idea of two 500 gal tanks, regulators do fail and that pool better be warm for the family. Like ALL you do: top notch! Quality doesn’t exclude you from Redneck STATUS! That’s about attitude and not intelligence. My students ask me if I’m a redneck and I don’t feel it’s an insult, rather a compliment regarding my attitude and convictions! Charles, double check with your local pane dealer but I ran a line from each tank outlet into a T. Then on that T I had a regulator as it went towards house actually my regulator on tanks was large enough to supply two separate lines that went into my house at two different locations. At each location going into house I had another regulator. Could you plumb a second heat source and use wood boiler to keep the temp right. My friend in WA uses a wood stove with coils as an only heat source for his pool. I keep forgetting about solar being from wet side of Washington. Snap. No turning back now. I don’t plan to heat the entire pool just the hot tub. But we’ll see what drain that has on the tank. Too many woods right now for solar but every tree that drops leaves in the pool may find a sudden demise. What about a wood boiler for the hot tub? How often will you be at the site? Not like you have to heat it all the time anyway right? I don't know how fast it would come up to temp but that might be doable. Please looks really great Charles! Any bet takers on the sat dish cable getting cut? For a moment I thought Don may have driven the Kobelco down from the tuck! Since I buried it I knew it was going to be a casualty. Just so happened to be the very first bite when they yanked the cedar stump out by the porch. No damage when things tore loose I hope. It had to be moved anyway right...Don't want it under that nice pool. 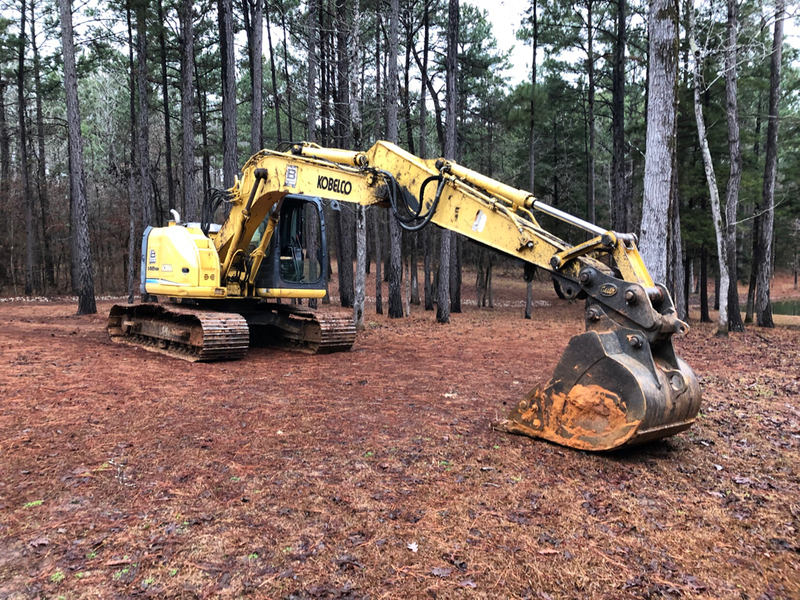 How come that thing will just pop a cedar stump out, and I’ve gotta dig all around it with my tractor? Looks like it’s going to be a real nice layout, I’m not letting my wife look at this thread. Wonder how long that would take??? Hole is finished. Rebar crew in it. Plumbing tomorrow, Gunnite tomorrow or friday. Wow these guys are fast. That will be really nice when its done! They are working fast. How come cement vs FG? I have solar for my pool and it was all diy. Got everything off CL. Works great but you need about the same area in panels as pool sf. I have a heater but have yet to install, just to get it ready earlier in the year and extend a few weeks. Would like more intel on the solar. 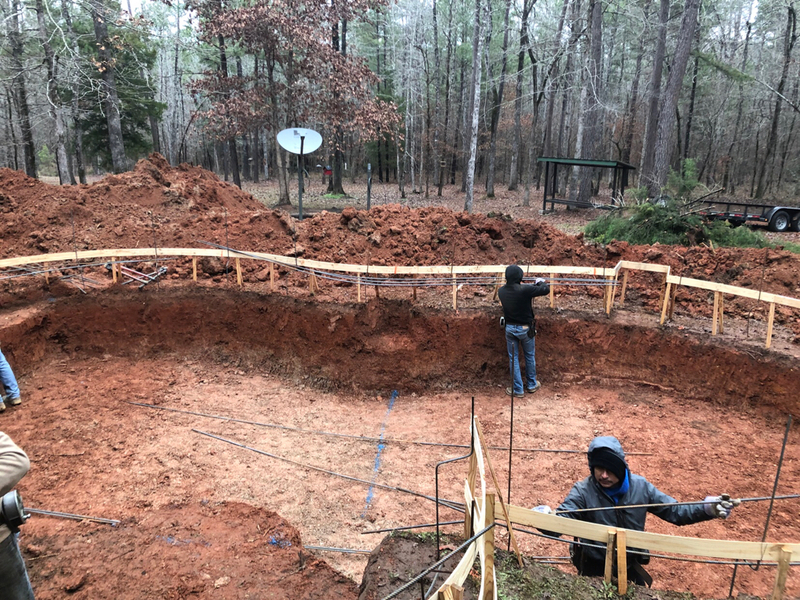 I debated FG for a long time and ultimately the ability to get warranty work and some stated issues with finish along with very few people willing to work with us this far out, I chose I local company that has been building pools, under the same name, for nearly 40 years. Where's the rough-in for the duck blind? Solar is easy. I find used panels fro around $50, new they are about $200 on ebay. I like the roof but any sunny area is fine. Tap into the filter inlet and I run a small 110v pump on a timer. The pool pump will work too, but that costs a lot more. Looks good Tex. If you cut all the trees that drop stuff into the pool you will have lots of room for solar. Sorry Tex but I had to laugh. All of this time I thought the house (shed) you have been building was your primary dwelling. I thought you also had a shop / garage there also as a stand alone. Then you were going to bring in containers for storage and gun/re loading room. Then I see the pictures of the actual house next to the pool and then the light bulb goes off that you have a retirement house there and the rest is all add on's. When I lived in NJ I had a very large pool and heated with Natural Gas. No spa but the wife likes 80 degree plus water or she won't go in. That thing cost me about $1000 a month to heat 5 months of the year. Plus another $1000 a month in electrical for the two pumps and 26 stations of sprinklers. I was always looking for a pool heater that was the type that floated on top of the water when you were not using it. Tons of lilly pads and other floaty types but I wanted one where you could hook up the return water line from the pump to it, it then circulates the return water through a series of dark floating pads and then returns the water back into the pool after it heats up. Similar to these but instead they would be like air mattresses with water flowing through rather than air. Scale able to whatever size of pool you had. I just realized I never posted the original house photo. The pool decking will mirror the full width of the house with the decking matching up to the porches on the front and back. Then when they do the decking in flagstone they'll also cover the porches in flagstone to match. 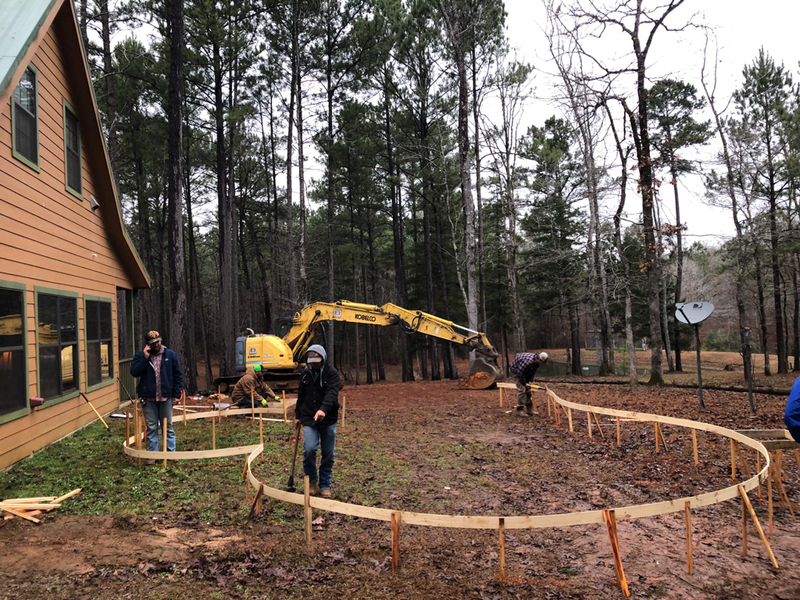 The outdoor kitchen will be a 14x24 slab, also covered in flagstone, angled and centered between the main house and the casita to form a kind of arc of buildings that look out over the pond. 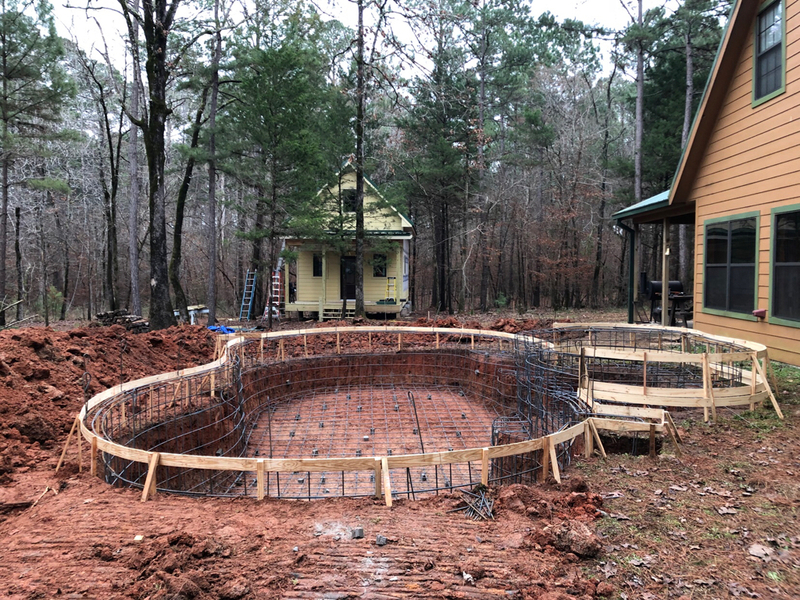 They'll tie the kitchen to the pool with a walkway and on the far side of the pool they'll pour a walkway and 18ft diameter area for a 6ft diameter fire pit. Its going to rain some this weekend so I'm hoping they get gunnite shot today. Then hopefully I can get back to wrapping up hardie or wiring electrical. A military leader spends a lot of his time training his men to be able to take over in the absence of something. Someone gets hurt, the next highest ranking guy steps in for hopefully what is a seamless transition. I have tried to build that into you, "People." I would have expected that from most of you, (Excepting the "Salt lake City kid" of course, but the rest of you have shown yourselves to be somewhat disciplined and focused. Charles here is building a pool, a rather dangerous and complex and expensive undertaking, I think we can all agree. And where is the oversight, I ask? Anything organized...anywhere? No just things from the SLC kid like, "Can I come and play!" There should have been some of you who organized into the "Construction committee" Self starters who would have seen the need to get involved to provide the quality information Charles needs to build this thing. And much the same as you have done with me with the building of SquareD, that counsel should arrive well after the decision was made, the concrete is in the ground and all thoughts of that phase had vanished...like that! And what of those (none of you) who are knowledgeable about laws rules, laws, regulations, and things of this sort, where are you I ask? There should have been something to advise Charles of all the things he has to consider which would constitute guidance. Information coming from JR's unregulated state, common pool practices from Sam and those in Minnesota, and some HOA member. Matters not that none of that is accurate, the effort should have been made and there should be a "committee of crap-house lawyers." Where are the psychologists who know everything there is to know about the mind of a woman who might have given good advice to Charles on how this all fits into his marriage (Of which you know absolutely nothing? ), where are you. We should have seen a mental health advisory committee form somewhere populated with guys like Phil. I mean if he can land a rocket going like ten thousand miles an hour that way, back here a few minutes later, figuring out a woman's mind should be child's play. I had hundreds of "Tips and advice" when building square D from peeps who wouldn't know a mig welder from an enema. I had paint experts commenting who were color blind, or just plain blind. I had 14 year old kids telling me about what they thought about how the military tires I selected would hold up. I even had a lieutenant comment about something, but I tossed that out years ago. Instead of just adding a pool, put a hot tub on the side of it. Darn it, already done. Oh, I know. You should put a flagstone surround and a huge fire pit and walkway, then redo your porches with said flagstone too. Dang it, he beat me to it. Sorry to say it, but I think he’s already chosen to do all the really big add ons already. I’ll keep looking though. saying is we are giving him quite a bit more lead way than you Don! Add to the fact you did nothing but complain about all our DOT efforts of the past & here we are, you even managed to run my second in command of DOT efforts off (Ashley) and I was left with Ken who has become a turncoat with Charles now diligently contributing to the chaos we work so hard to keep up here. But hey, good luck with that surgery! Yeah, I think it’s a toss up at this point! ...So you're sayin I'm gettin no support here? Quite the opposite, we give you a ton of support. It’s Charles that’s getting left out on the support! Not to mention that just saying we can’t DOT up his thread is in itself DOTing up his thread. "Hey guys here's a pic of the house we boug..."
If it weren’t for the labels, I would have thought that was Hillary’s political career. Now Don, I did ask where the duck blind was and JR already mentioned brushing in the hot tub. Have you considered that since Charles isn’t a pilot, he’s used to the concept of nobody else is going to service his abused equipment and therefore avoids using his slide rule as a hammer? Now, granted YOU fix whatever you break and mostly on your own, but you still need to master the art of Broke Stuff avoidance. You know.....how to avoid BS! Heavenly Father, guide Don’s surgeons and restore your servant to health in rapid fashion so he may continue to serve you .......... AND entertain the DOT Army you’ve placed in his life!